Formerly Spin Palace Casino, Spin Casino has been serving customers from around the globe since 2001 with great results. Licensed by the Malta Gaming Authority, powered by the high quality Microgaming software, with one of the highest RTP (Return To Player) rates in the industry, and offering generous bonuses, this casino has established itself as one of the go to places for the top notch gaming experience. Players from Canada are not only allowed to play, but they are also very welcome, as the casino features a special Canadian subdomain, where everything is adjusted for players from Canada, with bonuses being shown in C$. Banking methods favoured by Canadian players are also supported by Spin Casino. Like all casinos running on the industry leading Microgaming software, Spin Casino offers a great variety of games, delivered in a very visually appealing and user friendly interface. The casino offers downloadable software and instant play option for Windows users, while Mac players are restricted to the instant play, although this doesn’t take anything away from the experience, as the Mac version has been optimized for iPhone and iPad users. There is also a mobile version of Spin Casino, discussed in more detail further in the text. The casino features more than 450 games available to players at all times. Some of the favourite games of Canadian players can be found on Spin Casino. As mentioned in the introduction, Spin Casino features one of the highest RTP rates in the industry with the astonishing 97%. If this number seems too high to believe, rest assured it is correct, as it has been independently verified by eCOGRA. Featured Spin Casino games are, of course, big Microgaming’s progressive slots like Mega Moolah (offering huge jackpot payouts) and King Cashalot. If you want to chase a progressive jackpot but prefer playing three reel slots, there is a solution to that problem as well, in form ot the Cash Splash slot. As of recently, they has also introduced a Live Casino, offering roulette, blackjack, and baccarat tables. That’s a total of C$1,000 you can get simply for depositing. Of course, you don’t have to take advantage of all three bonuses and you can make smaller deposits if you like. The percentages still stay the same. If, for example you deposit C$100 on your third deposit, you will receive C$100 in bonus money. Overall, while the amount of the welcome package is rather decent, wagering requirements are not that player friendly. They definitely lag behind 888 Casino, where you only need to wager 30x the bonus amount, but are exactly the same as at Jackpot City. It isn’t a bad offer, but be aware that making these requirements will require some serious playing time. Spin Casino does offer a mobile version of their casino available at both Androids and iPhones. 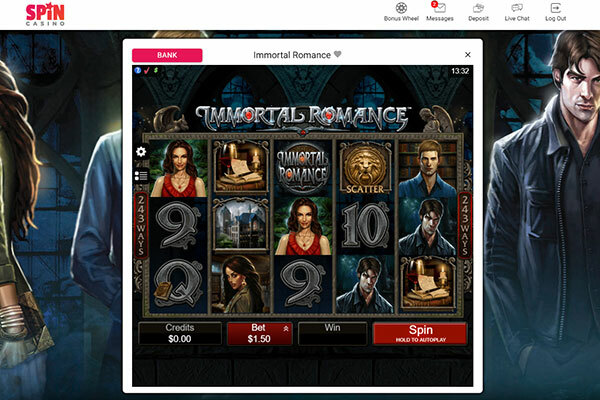 You can either use their instant casino to access nearly all games on offer or, if you so prefer, you can download individual applications (games) straight to your mobile device for quick and easy access. Some of the games available for download include Major Millions, Thunderstruck, Mega Moolah, and a few other jackpot slots. Apart from the welcome bonus, Spin Casino also offers some very nice weekly promotions for their players. There are regular slot tournaments, special bonus offers, and Loyalty Points that award your play and can be exchanged for cash at all times. High rollers receive special treatment at Spin Casino, as they enter the VIP Club, earning 40% additional Loyalty Points, enjoying even faster withdrawals, and getting invitations to special, exclusive events. The Spin Casino customer support team is always there for you to offer their assistance. 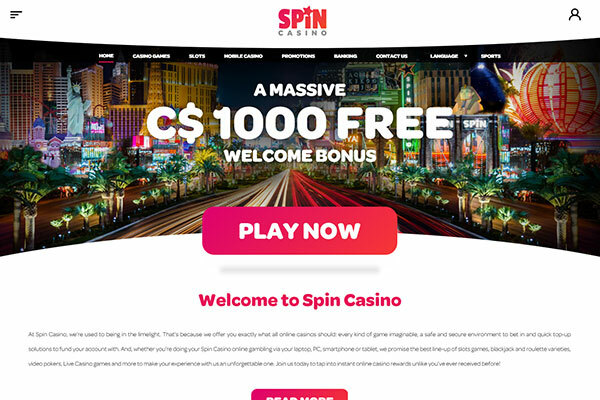 Spin Casino offers a variety of banking methods, from popular credit cards like Visa and MasterCard, debit cards, and bank transfers to a number of e-wallets including Canadian friendly Neteller and PayPal. There are no fees on deposits or withdrawals, and all banking can be done in CAD (C$). Withdrawal times are always one of the biggest concerns for players, and rightfully so. We all want to have our money available in the shortest time possible, without any unnecessary holdups. With Spin Casino, once you’ve confirmed your identity sending in your ID and proof of residence, things will be smooth and quick. All withdrawals are processed within 48 hours. After that, the money will be sent out and it can take up to four or five days to appear in your bank account, if that’s the method you used. If you are using one of numerous e-wallets, which are preferred by most players anyways, the money will be available to you almost immediately after processing. 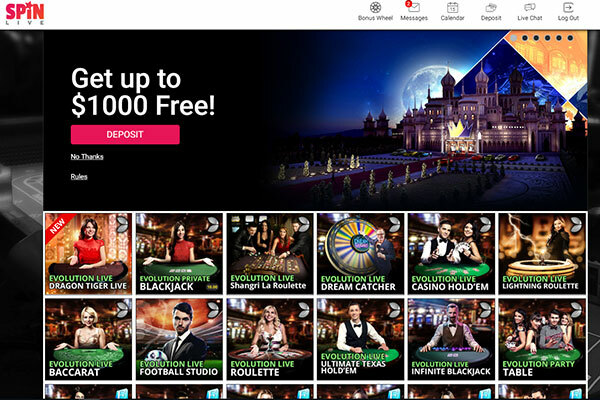 Spin Casino is a one of the online casinos definitely worth your time. They feature a really nice selection of games, appealing software, and cater to Canadian players by letting you play in the native currency and even offering dedicated, toll free support number for Canada. Offering one of the highest Return To Player rates in the industry, combined with generous welcome package and regularly running promotions, Spin Casino will make you feel welcome every step of the way. A few downsides are relatively high playthrough requirements for bonuses as well as the fact they do not offer one dedicated casino mobile app, but these are smaller issues when all things are considered, especially for players who play regularly.